The Ninth International Conference on Parallel and Distributed Computing, Applications and Technologies (PDCAT'08) was held in Dunedin, New Zealand from 1–4 of December, 2008. John Mehnert-Spahn (UDUS) presented XtreemOS within an invited talk "XtreemOS: Beyond Grid Middleware" (slides) within the workshop "High Performance and Grid Computing" co-located with PDCAT08. 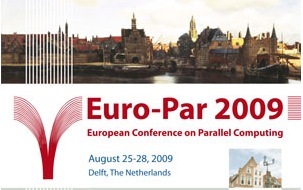 Furthermore, he also presented the paper "Checkpointing Process Groups in a Grid Environment" within the main track of the International Conference on Parallel and Distributed Computing, Applications and Technologies (PDCAT) in Dunedin, New Zealand, December 2008.